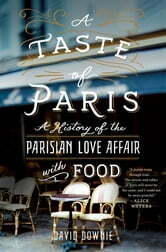 In his trademark witty and informative style, David Downie embarks on a quest to discover “What is it about the history of Paris that has made it a food lover’s paradise?” Long before Marie Antoinette said, “Let them eat cake!” (actually, it was brioche), the Romans of Paris devoured foie gras, and live oysters rushed in from the Atlantic; one Medieval cookbook describes a thirty-two part meal featuring hare stew, eel soup, and honeyed wine; during the last great banquet at Versailles a year before the Revolution the gourmand Louis XVI savored thirty-two main dishes and sixteen desserts; yet, in 1812, Grimod de la Reynière, the father of French gastronomy, regaled guests with fifty-two courses, fifteen wines, three types of coffee, and seventeen liqueurs. Following the contours of history and the geography of the city, Downie sweeps readers on an insider’s gourmet walking tour of Paris and its environs in A Taste of Paris, revealing the locations of Roman butcher shops, classic Belle Epoque bistros serving diners today and Marie Antoinette’s exquisite vegetable garden that still supplies produce, no longer to the unfortunate queen, but to the legendary Alain Ducasse and his stylish restaurant inside the palace of Versailles. 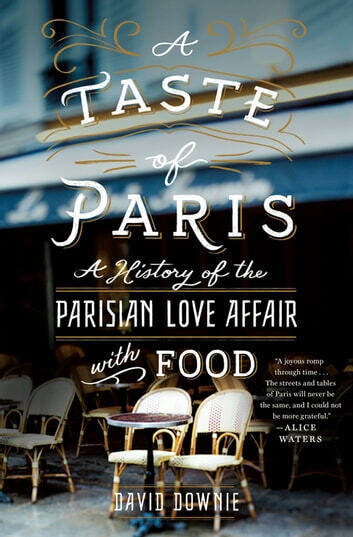 Along the way, readers learn why the rich culinary heritage of France still makes Paris the ultimate arbiter in the world of food.